Our product range includes a wide range of biomass briquettes dryer and agricultural waste biomass dryer. The whole wood drying machine mainly consists of hot wind stove, material feeder, drying pipe, dying cyclone, cyclone separator and controlling system. When the sawdust pass through the pipeline, the wet moisture will be removed from the material and the dried sawdust is discharged from the cyclone separator. This drying machine adopts two time circulate heating system, strengthening the heat and mass transfer rate, material moisture at 50% can be dried into the requirement of making wood briquettes at one time, greatly save the labor. 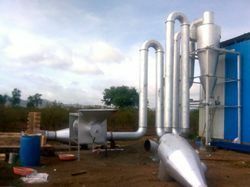 We have two types of sawdust dryer for the customer choose. 1. Drying the wet saw dust into optimal moisture (8-14%) for making wood briquettes .